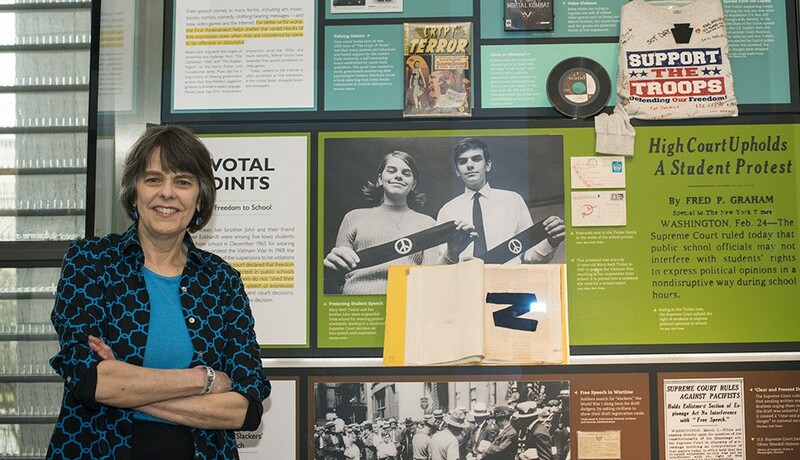 Mary Beth Tinker at the Newseum in Washington, D.C., with the display about her 1969 Supreme Court case. Nearly 50 years ago, Mary Beth Tinker wore a black armband to her junior high school in Des Moines to protest the Vietnam war. The 13-year-old student was sent home and suspended from school, as was her 15-year-old brother and another friend. The case eventually made its way to the Supreme Court as Tinker v. Des Moines School District, and ended with a landmark decision in favor of the students. To this day, the Tinker case is an important precedent for a question that comes up in many different ways: Do kids in school have a right to free speech? And advocating for that right is Mary Beth Tinker, who remains an activist for young people’s free speech. She’s been on a national tour since last fall, and stops at Washington State University today for the annual Friel Memorial Communication Seminar at 5 pm. Tinker’s tour is no victory lap or mere history lesson — the rise of the Internet and social media has created an entirely new realm of student speech. And it’s one that worries free speech advocates, because schools are cracking down on expression that doesn’t even happen on school grounds. Tinker has made more than 100 stops on the tour so far to talk about her experience and tell students why their voices matter. Tomorrow she speaks at Pullman High, then continues on to the Seattle area.